Nancy TAYLOR, Basket (08-1063), 36cm x 37cm x 13cm, Spinifex and Acrylic Wool. Come and join us at ReDot Fine Art Gallery for some mulled wine and festive cheer as we celebrate the holiday season and the opening of our annual Stockroom exhibition of affordable artworks by artists from many different art centres within Australia. A perfect opportunity to beat the retail madness, and to find a gift for that special someone, or yourself. Whatever your budget or taste in art, you are sure to find something that will make for a memorable, long lasting present which will stand out from the usual soaps-and-socks gifts under the tree. We will have some engaging works by Jean Yaritji Lane who uses her paintings to tell the story of the Seven Sisters using a beautiful contrast of colours. Or perhaps you might be captured by the truly exquisite artworks from award winning and senior Walmajarri artist, Wakartu Cory Surprise. 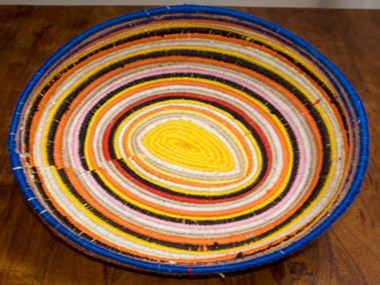 We also have some stunning woven baskets by Nancy Taylor, from the Martumili community that would make for the perfect centrepiece in anyone’s home. We hope to see you on Tuesday 7th December, from 12-7pm, for a nice glass of wine and tasty seasonal treats! The exhibition will remain up until Saturday 18th December, when we will finally take a WELL deserved break and see you all fresh and ready for an exciting 2011, full of great shows and exciting new works. 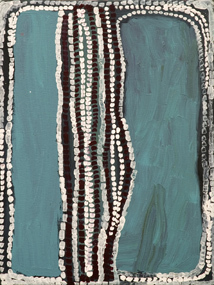 Jean Yaritji LANE, Minyma Kutjara Tjukurpa (09-241), 121cm x 60cm, Acrylic on Canvas. Wakartu Cory SURPRISE, Kirriwirri Kartu (271/07), 45cm x 60cm, Atelier Acrylic Paint on 14oz Canvas.